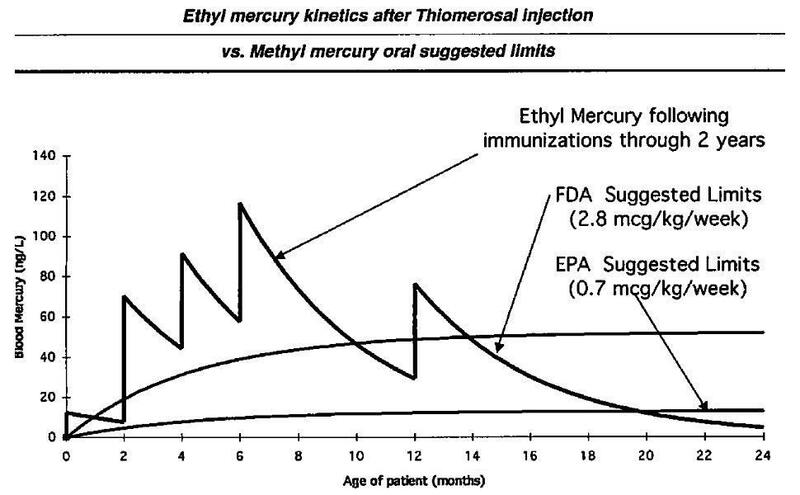 Finally it’s coming to light and the fact is being told: Vaccines given to infants contained inordinate amounts of ethylmercury in the form of Thimerosal; the CDC knew about it and conspired to keep the devastating reality of mercury damage from healthcare consumers and public health agencies. A true crime against humanity and nothing short of federal agency child abuse! Those calculations were made back in the late 1990s and CDC officials have been covering up their voodoo vaccine consensus science ever since! Those actions should be prosecuted as crimes against humanity, including excessive child abuse by a government agency, and the CDC should be revamped from the inside out; restructured; and ‘surgically’ separated from Big Pharma. The CDC brainwashing of the global medical profession, international health agencies and the media regarding the deceitfulness of vaccine ‘safety’ is nothing short of criminal action, which must be addressed at every level: local school districts, state health agencies, national courts globally, and the World Health Organization, a ‘mouthpiece’ of CDC’s deceitfulness and fraudulent research and health recommendations. None comes to mind more so than the CDC’s always trotting out the indicted Poul Thorsen’s infamous research that vaccines don’t cause autism! What does mercury affect in the human body? The brain and central nervous system! Ignoring Etzel’s [U.S. Department of Agriculture’s Ruth Etzel, MD] wise advice, the CDC elected to paper over their catastrophic mistake and double down on vaccine mercury. By continuing to allow thimerosal to be used in vaccines, the CDC is causing harm to American pregnant women, their growing babies and to 100 million children all over the planet. And now we have proof that our regulators know exactly what they are doing. Robert Kennedy Jr. will meet up with his uncle’s and father’s fate of being shot. It’s not past vested interests to go to any lengths to protect their turf and enforce their agendas. Big Pharma will be allowed to get more than its nose under the tent during the investigation. Big Pharma should be kept in outer space with independent scientists performing all assessments. Congress must not turn a deaf ear and blind eye on what’s being uncovered, as Congress probably has more responsibility than anyone by granting vaccine makers what turned out to be a “get out of jail free” card in the vaccine law Congress passed in 1986. It must be replaced with equitable law, since the vaccine court masters do a very poor job of implementing the real intent of the law. Vaccine law in the USA must be changed to enforce consumers’ rights to sue vaccine makers individually and collectively for promoting fraudulent vaccine science; product liability disasters; child abuse; and crimes against humanity. Big Pharma and its lobbyists by law must be prohibited from lobbying Congress and federal agencies. Pregnant women should not be mandated to receive vaccines. Nothing short of the above even can begin to rectify some of the horrors perpetrated upon several generations of children globally. California should be ashamed of itself and its SB277 ! Richard Pan, MD, should be struck from medical licensure and not permitted to practice. By the way, if readers really want to know the health problems associated with many other neurotoxins and chemicals in vaccines than ethylmercury, which still is in vaccines, you may want to read my book Vaccination Voodoo, What YOU Don’t Know About Vaccines. It discusses from published peer review science and journals what those toxic ingredients do in the body. However, I wish Robert Kennedy Jr. would also take a very serious look at microwave radiation EMFs/RFs and the non-thermal radiation wave adverse health effects they are causing. I predict they, along with G5-in-the-sky, will be worse than the autism pandemic we are experiencing in our children: one in 10,000-15,000 in the 1970s; one in 68 in the USA. Check out other countries here. We’ve seen the demonstrations for women’s rights after the Trump inauguration. Well, isn’t it time to organize about the rights of fetuses, newborns, infants, and toddlers being subjected to apparently legal and condoned chemical child abuse which is making them the sickest demographic statistic of all time for children regarding chronic diseases. Let’s protect the future of humankind, our children!